As we celebrate Martin Luther King, Jr. Day, I wanted to share a favorite MLK quote, “Faith is taking the first step even when you do not see the whole staircase.” I have had to remind myself of this on many occasions. I hope it inspires you, as well. We are taking advantage of our holiday today! It is a brisk 21 degrees out, and my daughter is planning to stay in her PJ’s all day…. at least that is the goal she verbalized to me. LOL! I thought a fun breakfast treat would makes it even better! I recently saw this recipe on Pinterest – of course! Here is the LINK to the original recipe. Grace loved helping me make this simple treat. She added the chocolate chips and marshmallows (eating a few along the way). As you see by the pictures, the marshmallows seems to completely melt away, but the flavor remained. Add chocolate chips and marshmallows then roll the crescents. I pinched the ends to try and keep all the goodness from melting out. There was still a little that oozed out, but pinching the ends did help. Add the chips and marshmallows. Roll up, and pinch the ends. Bake at 375 for 10 minutes. Yum! I think my teenagers would love those crescents! Thanks for hosting, Lisa! I seem to keep missing you…glad I saw it on Facebook! Thank you for hosting. My submission this week is #24, French toast casserole. I love your blog hop!!! They look delicious! 🙂 Thanks so much for hosting. My kids are in their early teens and they always want to stay in their pjs… sounds like a very relaxing day. Thanks for the party. 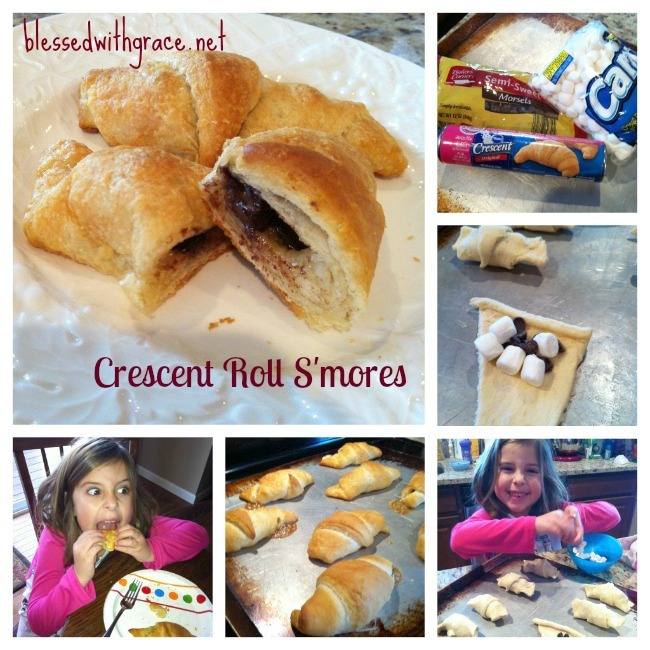 I love crescent rolls….you can do almost anything with them! We like adding butter, cinnamon and sugar to them; or chocolate chips & peanut butter. Next time we’ll be adding marshmallows! Thanks for hosting each week! I added my twist on Magic Bars to the linky. Thanks for hosting. I’ve been a part of your Tuesdays for so long that I feel Grace is growing up before my very eyes! I’m sure you feel that way too, Mom 🙂 Thanks for the easy recipe. The pictures of Grace are too cute 🙂 Thanks for hosting! I am hosting a link party today also, hope to see you there. Gosh I can’t tell you how much I love cooking with cresents,now look you’ve up the ante,CHOCOLATE!..YAY! Next post: Be a blessing….